Increasingly public sector practitioners are turning to design to help them do more with less. This often takes the form of designing tools or resources that are used by public sector workers in their everyday practice. This paper critically examines the practice of tool design with the aspiration to improve creative engagement (that is, novel interactions that result in the creation of new knowledge or understanding in the public sector). We assert that designers should not be attempting to define what is a 'right' or 'wrong' way to use an engagement tool, but instead seek to enable new interpretations and adaptations of tools so the creativity of practitioners is supported and amplified. We present a proposal for a framework that supports people in organising the multitude of creative engagement tools in a manner that is meaningful to them rather than imposing taxonomies form the outside, enabling them to fix their own meanings, significance and use of the tools they use. To explore this we present 2 use cases, one by IRISS (a leader in innovation in the social services in Scotland) and a second by Leapfrog (a research project led by Lancaster University looking to transform public sector engagement by design). We believe this change in the terms of reference when thinking about the creation and use of tools has profound implications for designers working in the social services and wider pubic services sector. Alves, R., & Nunes, N. J. (2013). Towards a Taxonomy of Service Design Methods and Tools, 4th International Conference on Exploring Services Science, IESS 2013. Bernstein, B. (1971). Class, Codes and Control. Volume 1: Theoretical Studies Towards a Sociology of Language. London: Paladin. Björgvinsson, E., Ehn, P., & Hillgren, P. A. (2012). Agonistic participatory design: working with marginalised social movements. CoDesign, 8(2-3), 127-144. Bryant, L. R. (2014). Onto-Cartography. Edinburgh University Press. Clennon, O. D., Kagan, C., Lawthom, R., & Swindells, R. (2016). Participation in community arts: lessons from the inner city. International journal of inclusive education, 20(3), 331-346. Conole, G. (2009). The role of mediating artefacts in learning design. In Handbook of Research on Learning Design and Learning Objects: Issues, Applications, and Technologies (pp. 188-208). IGI Global. Crilly, N. (2011). The design stance in user-system interaction. Design Issues, 27(4), 16-29. Cruickshank, M. L. (2014). Open Design and Innovation: facilitating creativity in everyone. Gower Publishing, Ltd.
Cruickshank, L., Coupe, G., & Hennessy, D. (2016). Co-Design: Fundamental Issues and Guidelines for Designers: Beyond the Castle Case Study. Swedish Design Research Journal, 9(2), 46-57. Dewey, J. (1916). Democracy and Education: An Introduction to the Philosophy of Education. The Macmillan Company. Donetto, S., Pierri, P., Tsianakas, V., & Robert, G. (2015). Experience-based co-design and healthcare improvement: Realizing participatory design in the public sector. The Design Journal, 18(2), 227-248. Engeström, Y., Engeström, R., & Kärkkäinen, M. (1995). Polycontextuality and boundary crossing in expert cognition: Learning and problem solving in complex work activities. Learning and instruction, 5(4), 319-336. Fill, K. (2005). A learning design toolkit to create pedagogically effective learning activities. Journal of Interactive Media in Education, 2005(1). Forester, J. (1982). Planning in the face of power. Journal of the American Planning Association, 48(1), 67-80. Freire, P. (1970). Pedagogy of the Op- pressed. New York: Herder and Herder. Gauntlett, D. (2007). Creative and reflective production activities as a tool for social research., ESRC Research Development Initiative: Building Capacity in Visual Methods, Introduction to Visual Methods Workshop, University of Leeds, Leeds. Hasu, M., Engeström, Y. (2000). Measurement in action: an activity-theoretical perspective on producer–user interaction. International journal of human-computer studies, 53(1), 61-89. Huitzinga, J. (1944). Homo Ludens: A study of the play element in culture. Routledge and Kegan Paul. Jewett, T., & Kling, R. (1991). The dynamics of computerization in a social science research team: A case study of infrastructure, strategies, and skills. Social Science Computer Review, 9(2), 246-275. Kagan, C., & Duggan, K. (2011). Creating community cohesion: the power of using innovative methods to facilitate engagement and genuine partnership. Social Policy and Society, 10(3), 393-404. Lambe, P. (2007). Organising knowledge: taxonomies, knowledge and organisational effectiveness. Cambridge: Chandos. Leadbeater, C. (2010) We-think. Profile books. Mager, B. (2004). Service design: A review: Köln International School of Design. Manzini, E. (2015). Design, when every- body designs: An introduction to design for social innovation: MIT press. Meroni, A., & Sangiorgi, D. (2011). Design for services. Gower Publishing, Ltd.
Mortati, M., & Cruickshank, L. (2012). NETS: a design tool for activating social networks. International Journal of Entrepreneurial Behavior & Research, 18(4), 509-523. Norman, D. A. (1991), ”Cognitive artifacts”, Designing interaction: Psychology at the human-computer interface, 1, 17-38. Sanders, E. B. N., Brandt, E., & Binder, T. (2010). A framework for organizing the tools and techniques of participatory design. In Proceedings of the 11th biennial participatory design conference (pp. 195-198). ACM. Sanders, E. B. N., & Stappers, P. J. (2008). Co-creation and the new landscapes of design. Co-design, 4(1), 5-18. Sarkissian, W., & Wenman, C. (2010) Creative community planning: Transformative engagement methods for working at the edge. Routledge. Smith, M., Doel, M., Cooper, A., Simmonds, J., Solomon, R., Kohli, R., Parkinson, C. (2010). Relationship-based social work: Getting to the heart of prac- tice. Jessica Kingsley Publishers. Star, S. L. (1989). ‘The structure of ill-structured solutions: boundary objects and heterogeneous distributed problem solving (pp. 37-54). Star, S. L., & Bowker, G. C. (2006). How to infrastructure. Handbook of new media: Social shaping and social consequences of ICTs, 230-245. Star, S. L., & Griesemer, J. R. (1989). Institutional ecology, translations and boundary objects: Amateurs and professionals in Berkeley’s Museum of Vertebrate Zoology, 1907-39. Social studies of science, 19(3), 387-420. Suchman, L. (1993). Working relations of technology production and use. Computer Supported Cooperative Work, 2(1-2), 21-39. Tarmizi, H., & de Vreede, G. J. (2005). A facilitation task taxonomy for communities of practice. AMCIS 2005 Proceedings, 485. Von Hippel, E., & Katz, R. (2002). Shifting innovation to users via toolkits. Management science, 48(7), 821-833. Walsh, G., Foss, E., Yip, J., & Druin, A. (2013). FACIT PD: a framework for analysis and creation of intergenerational techniques for participatory design. In proceedings of the SIGCHI Conference on Human Factors in Computing Systems. Winter, K. (2009). Relationships matter: the problems and prospects for social workers’ relationships with young children in care. Child & Family Social Work, 14(4), 450-460. 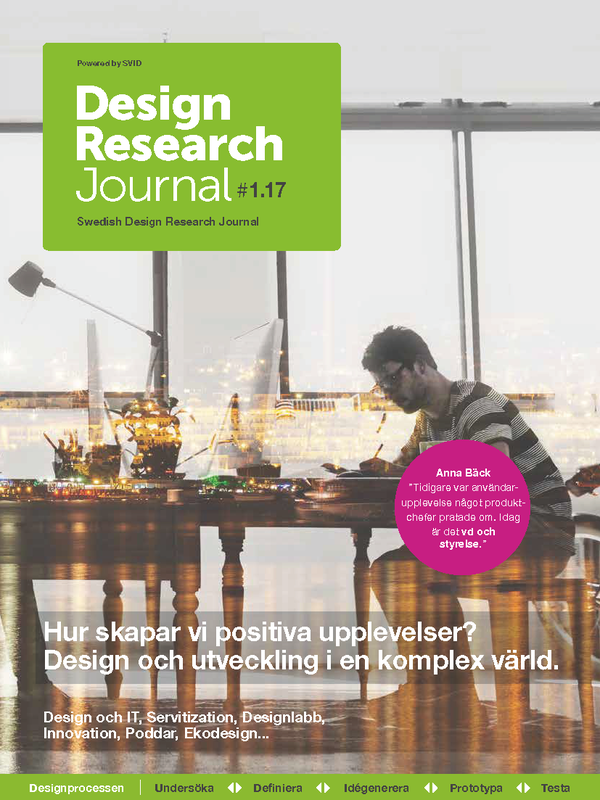 Cruickshank, L., Whitham, R., Rice, G. and Alter, H. (2017) “Designing, Adapting and Selecting Tools for Creative Engagement: A Generative Framework”, Swedish Design Research Journal, 15(1), pp. 42-51. doi: 10.3384/svid.2000-964X.17142.